The ‘Yes2AV’ campaign, that are seeking to convince voters of the need for reform of the UK electoral system, are using extreme right-winger Nick Griffin as their boogeyman. 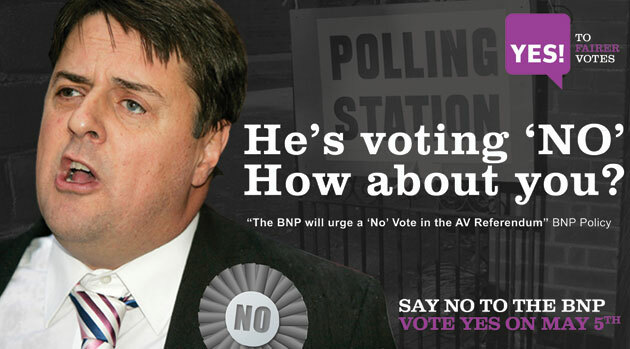 The BNP are urging their members to vote to keep the current FPTP format. Those campaigning for change have pounced on this as an example of FPTP favouring minority views (though I’m not sure I follow that logic). However, the way in which they’ve framed this point in the above poster is slightly more sinister. The key message take out from the communication is “if you vote to keep the current system, you’re helping the BNP”. Most people assumed that the ‘Yes’ campaign would opt for the ‘different kind of politics’ line of attack, but they’ve instead opted to use good, old-fashioned politics of fear. How confusing for the voter. The Yes campaign are producing the above poster at the same time Baroness Warsi stating that voting yes will let the BNP in. I guess then it will come down to who the voters trust more when they cast their vote, if they vote at all. Under AV the BNP would need t0 gain the support of 50% of voters in order to win a seat. The chances of this happening are effectively nil and thus the BNP are against AV. This is in complete contrast to the message coming from No2AV who are claiming AV will give the BNP an easy ride, is it the no campaign who are fearmoungering. This poster was in response to one of No2AV’s arguments and I think accusing Yes2AV of ‘using politics of fear’ on a single poster is rather unfair. The ad was forced on the Yes campaign to counter the smears from Warsi/Cameron and the video from No2AV that claimed that BNP voters would have had a decisive say in 30 seats at the last election (now debunked by the IPPR). When the PM and chairman of the ruling party freely start a national campaign with such scaremongering smears which could be effective, yes2av was bumped into responding as their silence could have been seen as an acceptance of the claim. Check out Channel 4’s fact check of the claim, where the BNP themselves openly admit (as shown in other elections) that AV will hurt them, which is why they want FPTP to stay. So independent research has shown the claim to be groundless and the BNP themselves detail why AV will hurt them. When will the PM apologise? This is a complete misconception about the way AV works. People voting for the minority parties do not get “more of the vote” under AV, despite what the AV NO campaign would have you believe. In each subsequent round of AV, EVERYONES has a vote counted again, including the people who voted for the most popular parties. The difference is that for people who vote for minority parties, their SECOND vote is counted again, where as for people who vote for the more popular parties, their FIRST vote is recounted. MANGO: Kadınların enn sevdiği markalar arasına adını kazıyan Mango’ɗа gece için pekk çߋk kıyafet mevcut.